What fonts can you assume Windows users will have? Mac users? And how about (gulp!) Linux & other UNIX users? Oh, & don't forget mobile users: iOS (iPhone, iPad, iPod Touch), Android, & Windows Phone 7! Still, it provides some useful results. Go take a look & it'll give you some numbers you can work with. Various resources also exist that give web developers some hard numbers & lists they can use when determining the fonts available on various operating systems. In addition to these, you should also check out Microsoft's “Fonts and Products”, which lists fonts supplied not only with Microsoft’s products, but also included in UNIX, Mac OS X, & Adobe products. There are hundreds of different UNIX variants out there (Linux itself is one, and there are hundreds of variants of Linux! ), so saying with certainty what fonts are safe to assume are on any particular user's UNIX box is difficult. Fortunately, even though there are hundreds of UNIX flavors, there are only a few that make up the majority of desktop use. When the iPad came out, it had more fonts on it than did the iPhone. Apple has since rectified that, & it's my guess that it will continue to make sure both devices have the same number of fonts on them. Android is a bit more complicated, because while it doesn't include very many built in fonts, apps can bundle whatever fonts they want (note that this is now true for Apple's iOS as of version 4; however, since iOS also comes with over 50 built in fonts, most apps don't need to include their own). Windows Phone 7 out of the box supports 16 fonts, including those in [Core Fonts for the Web] plus a few others. If you do not specify font-family, Segoe WP is used by default. However, like Android & iOS, developers can embed their own fonts in their apps if they desire. From 1996 to 2002, Microsoft made a collection of fonts it called "Core Fonts for the Web" available for free to anyone who wanted to download them (they were included on Windows, of course). Why? The company wanted there to be a standard set of fonts that web developers could count on in their work. By & large, that objective was met, & even though Microsoft officially ended the program a decade ago, those fonts are still included in Windows and on all Macs, and are still legally available all over the Web (in fact, a survey on the Ubuntu Forums indicates that over 75% of Ubuntu users have the Core Fonts installed; Ubuntu, for those who don't know, is the most widely used desktop variant of Linux). Now let's briefly look at those fonts. Andalé Mono (pronounced an-delay) is a pretty good monospaced font, & it used to be my favorite for coding. In particular, Andalé Mono does a great job distinguishing between zero & capital O, & the capital I, the lowercase l, & the number one. However, Microsoft no longer distributes it on Windows (although it still comes with Mac OS X), & instead promotes Lucida Console as its replacement. Arial isn't a horrible font—it's just boring & overused ("generic" & "bland" are used to describe it). It's also, interestingly, a ripoff of Helvetica, one of the best fonts ever made1. Basically, Microsoft didn't want to license Helvetica, so instead it licensed the far cheaper Arial, a poor copy of a far better font2. For years it was the default header font in Word (although that's finally ended since Office 2007), which meant that it was already overexposed before it started popping up on millions of websites. If you must use it, place it next to last in your CSS font stacks, as a fallback before you finally give up with the generic sans-serif. And please put Helvetica ahead of it, so those of us with decent fonts can enjoy that instead. Widely derided as one of the worst fonts ever made, you should never use Comic Sans on the Web. Or in print. Or in anything, ever. It's a ugly, stupid, crappy font that makes anything it touches look ugly, stupid, & crappy as well. Do not use Comic Sans or you will lose my love & that of your parents & friends. Courier New is designed to look like a typewriter. Whoop de doo. It's also a poor copy of the much better (& classic!) Courier. Boring, unimaginative, & with no good differentiation between easily-confused characters (see Andale Mono above, which does a great job at this), Courier New should never be anyone's first choice for a monospaced font. Since it's on so many computers, I guess it's acceptable—barely—to use at the bottom end of a CSS font stack, like this: "Andale Mono", Courier, Courier New, monospace. Georgia a serif font designed to be read on screen, not on paper. As such, it's wide, legible, and attractive. Note that I said "attractive", not gorgeous—it's not a font that takes your breath away, but it is one that's easy to stare at for hours. You can use it as a body font, but I wouldn't (I vastly prefer sans-serif fonts for that); instead, I'd feel free to use it as a header font. Impact is a heavy, slab serif font that is designed to, well, make an impact. As such, it should be used rarely & in short bursts. Not for headers (well, I guess on the right website it'd be OK for headers), but for special occasions. Microsoft made Times New Roman the default body font in Word (although that's changed since Office 2007), guaranteeing that millions upon millions of users had to look at it all day on printouts. To be honest, back then that wasn't awful, since the font was designed for print4. The problem was that Microsoft in its pin-headed brilliance made it the default font in Internet Explorer, which was a terrible decision. Times New Roman might look fine in print, but it looks like utter crapola on screen, being too thin & wispy to work well in that media. And even if it didn't look awful on a computer monitor, it's still ridiculously overexposed, like a rapper that guests on 5 of the top 10 current hits. Do not use Times New Roman on your websites. Vile & disgusting5. And now I will go wash myself. Verdana is a font that was designed for screen reading6, & it does a great job at that. If you want to use it high up on your CSS font stack, even first in the list, go right ahead—around 99% of Windows & Mac computers have it on them, & almost 70% of Linux boxes. In fact, I usually change my web browser's font prefs to make Verdana the default (if Candara isn't available; see more below), & my eyes always appreciate it. Want to insert little pictures into your document when you press letters on your keyboard? In other words, press these letters & output these shapes? Then you want a font that falls into a special category called dingbats. You will not use these often, but when you need them, they're nice to have. And, I have to admit, they're fun. Webdings is a dingbat font, & it has some fun characters in it, as you can see. One really nice thing about it: most of its characters don't have Unicode equivalents, so these are the only place you can easily get some of these images. Just don't go nuts with the dingbat fonts & litter your webpages with them. Show some restraint! Introduced with Windows Vista, Office 2007 for Windows, & Office 2008 for Mac OS X. 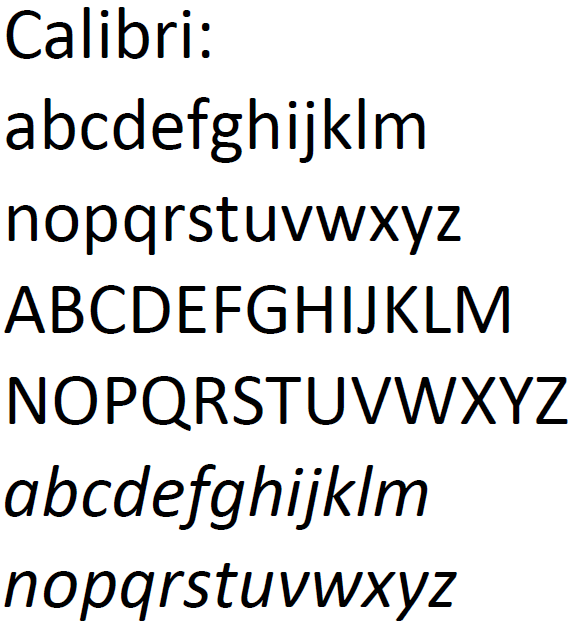 Starting in Office 2007, Microsoft replaced the default body font Times New Roman with Calibri, meaning that it's now familiar to millions of people all over the world. I don't prefer it for body text on websites (instead, I'd look at Corbel or Candara—or even good ol' Verdana!—for that), but it's not terrible. If you're looking for a sans-serif for headers (because you're using serifs for the body), Calibri would be a good choice. Not a bad serif font. At least it's a heck of a lot more readable on screen than Times New Roman. In particular, it's nice for business-y sites. By default, this is the new header font in Microsoft Office 2007 & up. 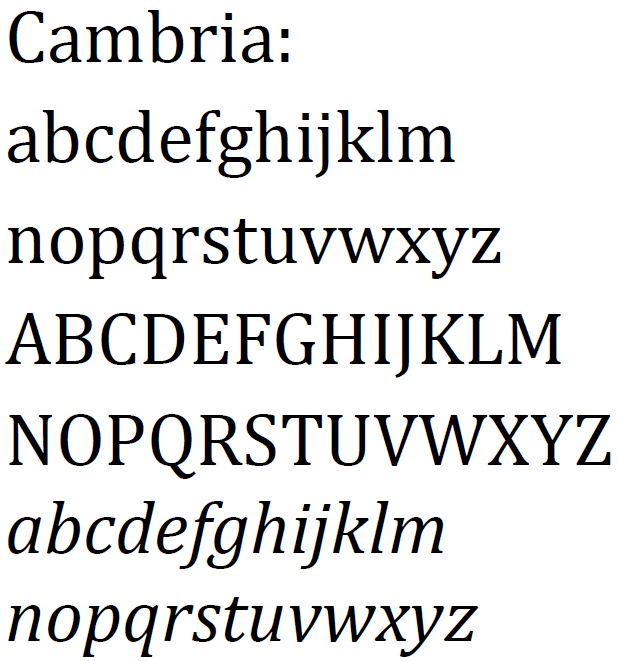 Candara has some very interesting design choices in it, including, as Wikipedia points out: "both entasis and ekstasis on opposite sides of stems, high-branching arcades in the lowercase, large apertures in all open forms, and unique ogee curves on diagonals." Candara is a sort of replacement for Verdana, but I still prefer Verdana, although Candara will work if you want something fresher & more stylish. 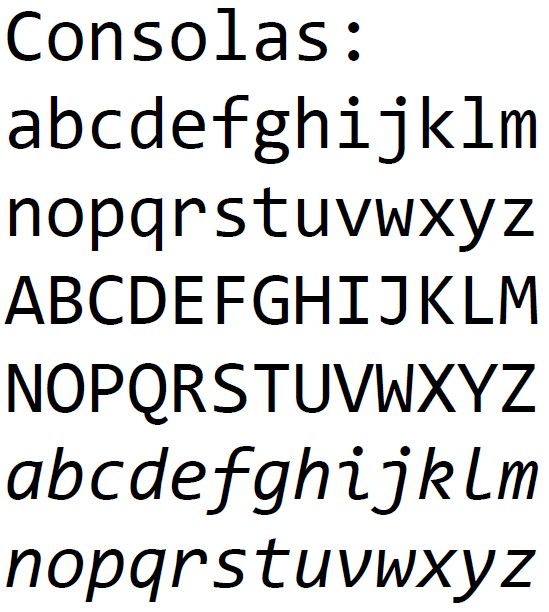 Since Andalé Mono is no longer included with Windows, Consolas is now the best monospaced font for coding that comes with Windows (sure, you can always search out others & install them, but I'm only talking about those that are already installed with Windows7). For instance, the zero actually has a slash through it so you can tell it apart from the capital O, & it's easy to tell the number one & the small letter l apart. Use Consolas instead of Courier New if you can. It's not a bad serif font at all; it just doesn't do much for me (although others really dig it). Give it a whirl. 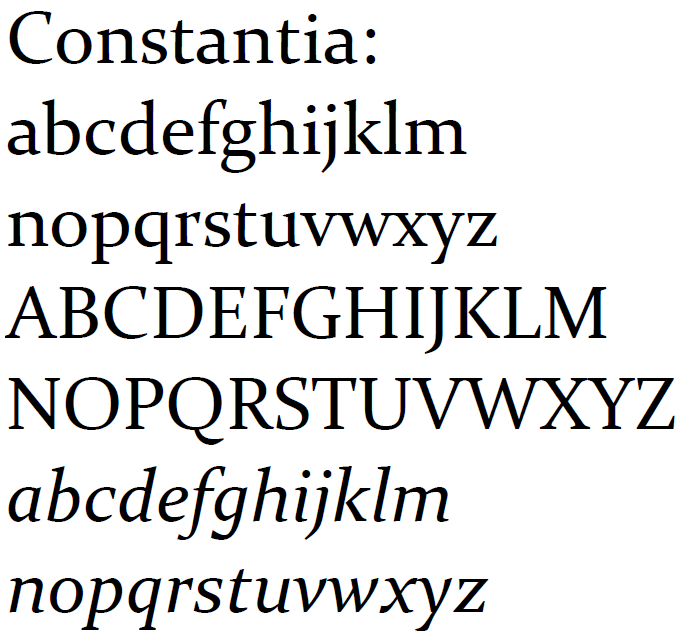 And keep in mind that Constantia was designed for both screens and print, so feel free to use it in both contexts. 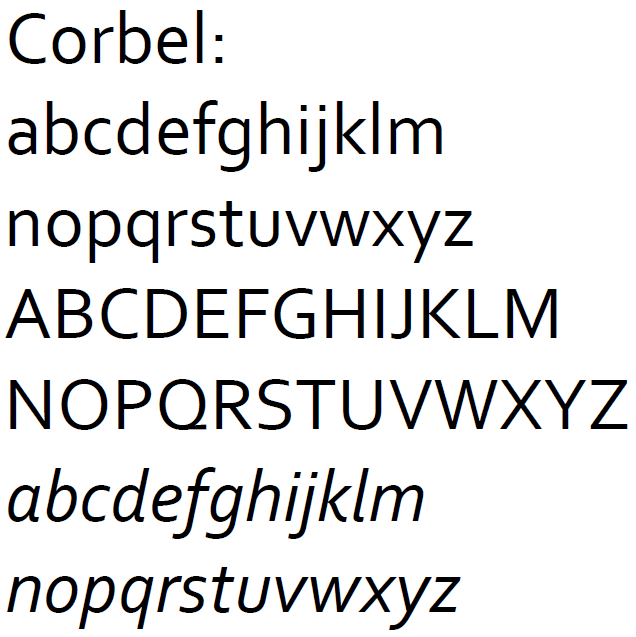 Corbel is a pretty nice sans-serif font, but it's no Frutiger, which it copies closely. In particular, the numbers in Corbel are nicely done. Use this instead of Trebuchet or Arial (please! ).